Do good things really come in small packages? Yes!! 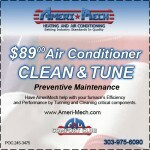 Ameri-Mech Heating and Cooling is a small, locally owned Longmont HVAC partnership that delivers big. Unlike those large, impersonal companies, at Ameri-Mech Heating and Cooling you will receive personal, competent and professional service. We service and install all major brands, offer free, no obligation estimates with no trip charges. We guarantee honest, timely appraisals of all your heating and cooling needs and at no time will we try to sell you something you do not need. We strive to keep overhead costs low and are proud of the fact that we pass those savings on to you, our valued customers. Combined, we provide over 20 years of experience in the HVAC industry, working throughout the Front Range from our Longmont HVAC shop. We feel we have a responsibility to provide high quality at a reasonable price and our installation specialists are not only experienced, insured and fully certified, but take great pride in offering superior workmanship. Our installations are carefully engineered with the goal of reducing noise and adding convenience for the customer. We are an authorized Bryant dealer who work hard to give you the greatest value for you money. We design and sell central air conditioning and heating systems for every size and type of home or business, large or small, throughout the Front Range. Call our Longmont HVAC company at 303-975-6090 for fast response and friendly service. Whether building a new home, remodeling or just in need of repairs or replacement, we guarantee quick, professional service and quality products. 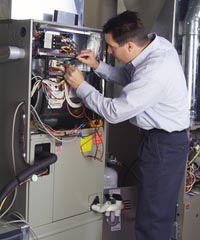 We are setting industry standards in furnace repair and home heating quality and your satisfaction is our number one priority. Ameri-Mech Heating and Cooling is a member in good standing of the Better Business Bureau of Denver, Colorado, and a Member of N.A.T.E., the North American Technician Excellence, certifying the finest in HVAC. Ameri-Mech Heating and Cooling has the ability to pull permits in the cities of Denver and Boulder. This is not true of every HVAC contractor in the area. They need to be licensed in Denver and Boulder AND have to pass a International Code Council (ICC) exam, a national exam covering all building codes pertaining to specific industries. For prompt professional service call 303-975-6090 now.